Are You Feeding Your Dog Harmful Food? Whilst there are many foods that we know we shouldn’t give to our dogs, such as chocolate, there are numerous items that you may not be aware of. Most of these foods don’t just cause sickness. They can actually cause severe health problems and put your canine’s life at risk. 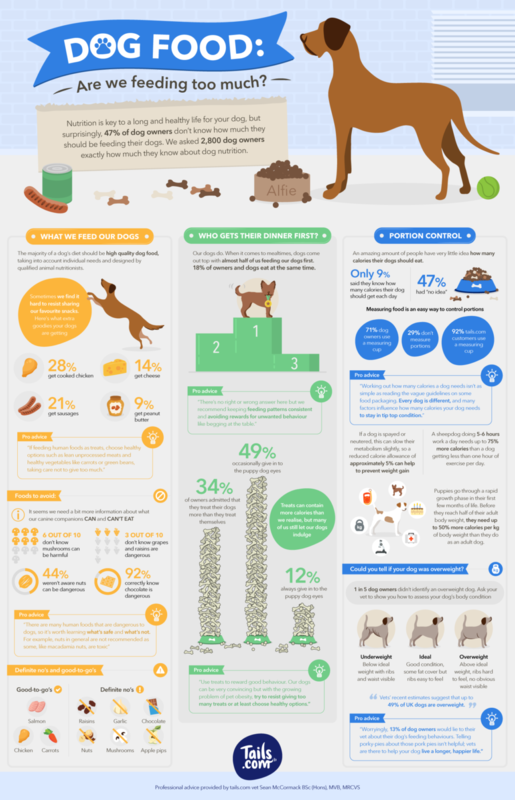 It’s surprising to see how many people aren’t informed about what their dogs can eat. A recent survey by Tails.com revealed that 44% of dog owners questioned weren’t aware that nuts were dangerous for dogs. If you fall under that percentage, it’s time to get educated. More statistics from the Tails survey can be seen in the below infographic. As you can see, the majority of dog owners aren’t completely clued up. If you’re ever unsure about giving your dog human food, always check online first. Or, simply follow your instinct and don’t give it to them! If you stick to dog food and treats, you’re always going to be safe. However, for those that want to treat their pet with a human snack, just ensure it’s safe to do so. Getting clued up takes no time at all time. It’s always better to be safe than sorry! About the Author: Emily is a young writer who is passionate about literature and blog writing.